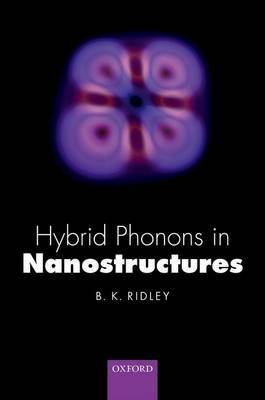 Author(s) Ridley, Brian K.; Ridley, Brian K.
The book provides a technical account of the basic physics of nanostructures, which are the foundation of the hardware found in all manner of computers. It will be of interest to semiconductor physicists and electronic engineers and advanced research students. Crystalline nanostructures have special properties associated with electrons and lattice vibrations and their interaction. The result of spatial confinement of electrons is indicated in the nomenclature of nonostructures: quantum wells, quantum wires, quantum dots. Confinement also has a profound effect on lattice vibrations. The documentation of the confinement of acoustic modes goes back to Lord Rayleigh's work in the late nineteenth century, but no such documentation exists for optical modes. It is only comparatively recently that any theory of the elastic properties of optical modes exists, and a comprehensive account is given in this book. A model of the lattice dynamics of the diamond lattice is given that reveals the quantitative distinction between acoustic and optical modes and the difference of connection rules that must apply at an interface. The presence of interfaces in nanostructures forces the hybridization of longitudinally and transversely polarized modes, along with, in polar material, electromagnetic modes. Hybrid acoustic and optical modes are described, with an emphasis on polar-optical phonons and their interaction with electrons. Scattering rates in single heterostructures, quantum wells and quantum wires are described and the anharmonic interaction in quantum dots discussed. A description is given of the effects of dynamic screening of hybrid polar modes and the production of hot phonons.